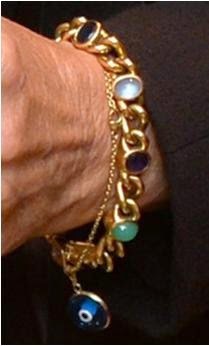 One of the more distinctive bracelets she wears is a charm bracelet of gold links with a variety of golden charms. In the picture above, you can see one of the charms is a gold disk engraved with 30.12.09, which is the date of birth for her twin grandsons Gus and Louis, so it's a good bet that the rest of the charms are similarly personal in nature. She doesn't wear this every day, but she's apparently a big fan of charm bracelets; The Duchess of Cambridge wears a similar gold bracelet with a gold disk charm that is thought to have been a gift from Camilla. Also seen in the above photograph, a thin golden chain with an eye at one station and a sideways cross at another is also a current favorite. The Duchess has also added a small nazar, an amulet said to protect against the evil eye, to the chain. You can often spot it dangling beneath the rest of her bracelets (seen below). The Duchess has two identical bracelets featuring thick gold chain links connecting a series of gold-set oval semi-precious stones in a variety of colors and types. She wears one or both at a time, and they have become favorites in recent years. This bangle bracelet with a twist of mixed color metals was listed in a Hello! magazine feature as a favorite for everything from evening events to tennis playing, and she continues to wear it for day events today. And these are just a few of the options most often spotted. Bracelets are part of her everyday "uniform", and she wears her favorites often enough that we won't catalog individual appearances here.